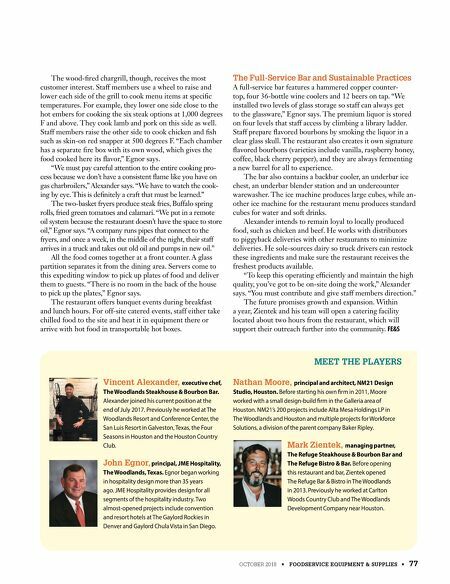 76 • FOODSERVICE EQUIPMENT & SUPPLIES • OCTOBER 2018 caption facility design p r o j e c t o f t h e m o n t h cooler and not on the production line," Alexander says. "He prepares vegetables, processes, portions and rotates these menu items as if he was working on the line. He sets the standard for everyone working in the restaurant." Staff prepare salads, the cheese and charcuterie boards and desserts at a small cold pantry station to the side of the hot production line. All desserts, such as red velvet cake and chocolate truffle cake, bake in a half-size combi oven that sits in the small cold pantry. Another staff member cooks vegetables in a small combi oven. Staff also use a six-burner range and small flattop to cook additional vegetables, seafood such as shrimp for linguini scampi and bourbon ginger glazed salmon, jumbo lump crab cakes, pork belly and side dishes. A convection oven beneath toasts breads and flatbreads and roasts Brussels sprouts and cauliflower gratin. Alexander breaks down cases of meat as they come in and begins butchering immediately after receiving deliver- ies. "A sous chef is in charge of the hot line and helps with butchering," he says. This enables him to spend all morning butchering and leaves him available for the restaurant's meals and catered events. He and staff use a mixer with a grinder component to grind the trim from steaks to use for burgers, sausages and salami. Butchery Room and Grill In October 2018 the owners installed a butcher room. "We'll have tighter controls and drive down costs by pur- chasing in bulk," Alexander says. "We'll be able to offer more charcuterie at the bar." The butchery area contains three custom-designed refrigerated and humidity-controlled compartments for curing prosciutto and sausages. A small fermentation cham- ber, which holds salami that age up to 40 days, stands adja- cent to guests who want to dine in this area of the restau- rant. Egnor researched all the potential options to support this meat aging and curing case. 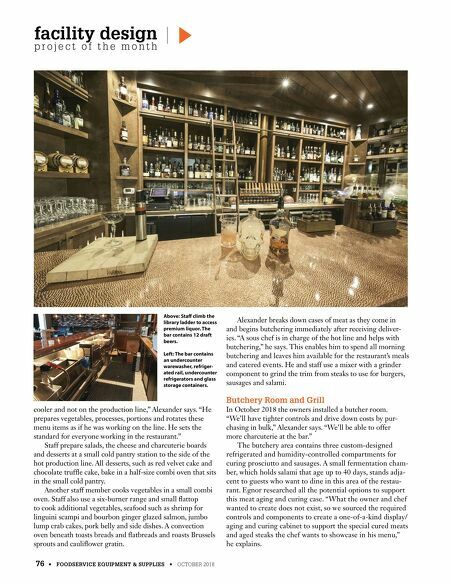 "What the owner and chef wanted to create does not exist, so we sourced the required controls and components to create a one-of-a-kind display/ aging and curing cabinet to support the special cured meats and aged steaks the chef wants to showcase in his menu," he explains. Above: Staff climb the library ladder to access premium liquor. The bar contains 12 draft beers. Left: The bar contains an undercounter warewasher, refriger- ated rail, undercounter refrigerators and glass storage containers.